I doubt theres much use for those mirrors on craigslist.. they do come in real handy when parking a bus into tight spots.. you can pull up to the inch when needbe.. I use mine all the time.. probably nor as necessary in a van cutaway as you can see over the hood better than in a full size bus. my carpenter has nice low ones with poles.. much easier to deal with.. my bluebird has the taller ones.. i'll probably yank at least one of them on that bus..
We took them off for the time being mainly because I kept running into them in the driveway. If we miss them, we can always re install. Ordering speakers, fantastic fan, and pmd relocation sometime this week, stay tuned! A little update. 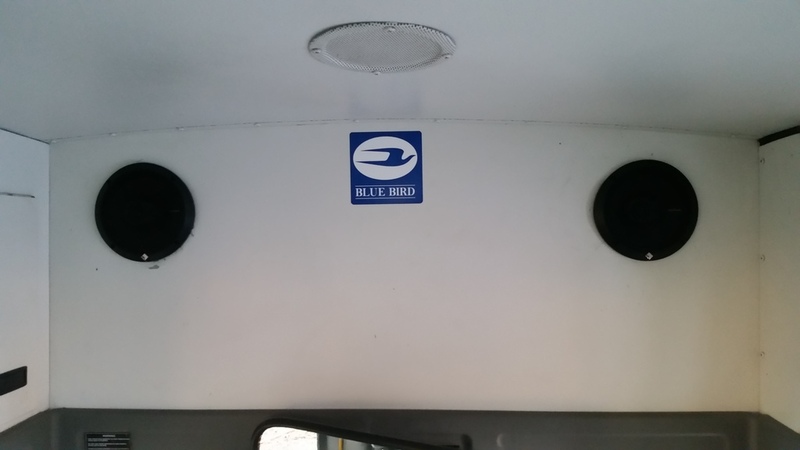 We got new speakers installed in the front of the bus. I think we might install a head unit in the bulk head above the driver and install rear speakers as well, but that's later. We lost our escape hatch while travelling down a county road last weekend. We drove back and retrieved it, but were expecting a bit of rain this week so we installed a sky-light. I used Lexan and stainless steel self taping screws. A fantastic fan will be installed in this hole at some point after our ski trip. I picked up a bunch of lumber from the Lowes scrap pile and will be putting it to work on a temporary bed platform for our December trip. We have been planning to remove the rear heater from the bus and capping off the lines. We are planning on travelling the West and Northwest US in the summer and fall months and don't plan on needing a lot of heat. Would a Buddy Heater work for those cold nights/mornings to just heat up the bus? How did you cut out for the speakers? Mine just arrived so i'll be putting them in soon. Also look for garage door installers for odd size pallets with lots of 2x4's. Ones i found here were 19' long with 4 2x4's per pallet. Useful for framing up beds etc. The process was mostly using tin snips to cut small (<1") cuts out from the center, all the way around and folding them back into the hole. It was crude and looked really bad before the speakers were in. I'll keep and eye out for long pallets, thanks for the tip! 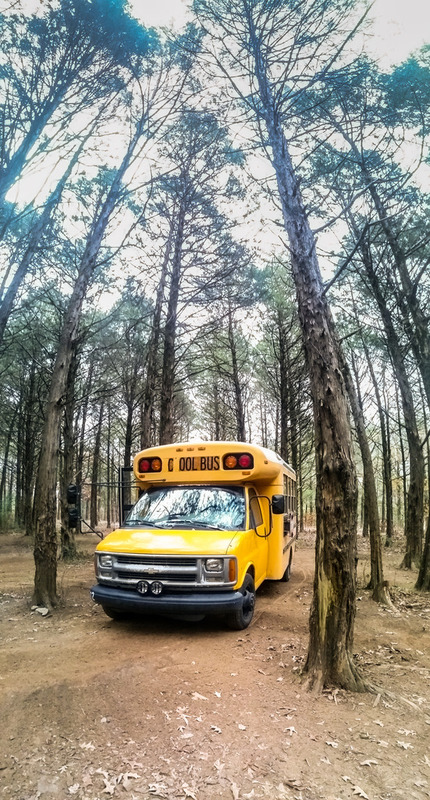 We took our first shakedown trip in the bus. 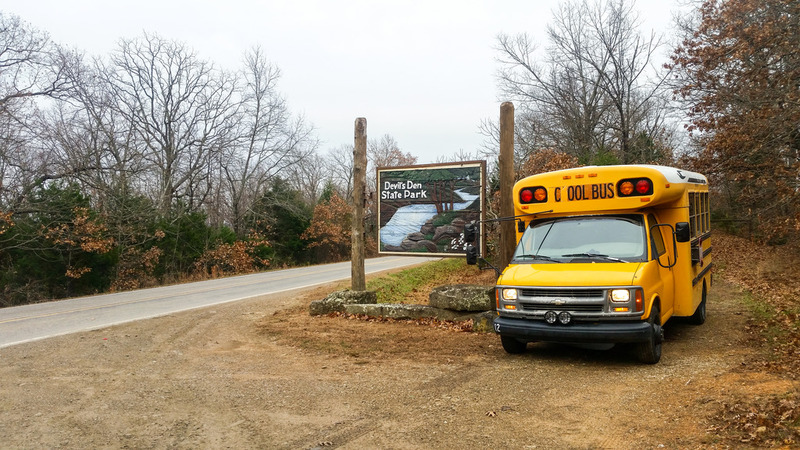 We visited Devil's Den State Park in NW Arkansas for the weekend. 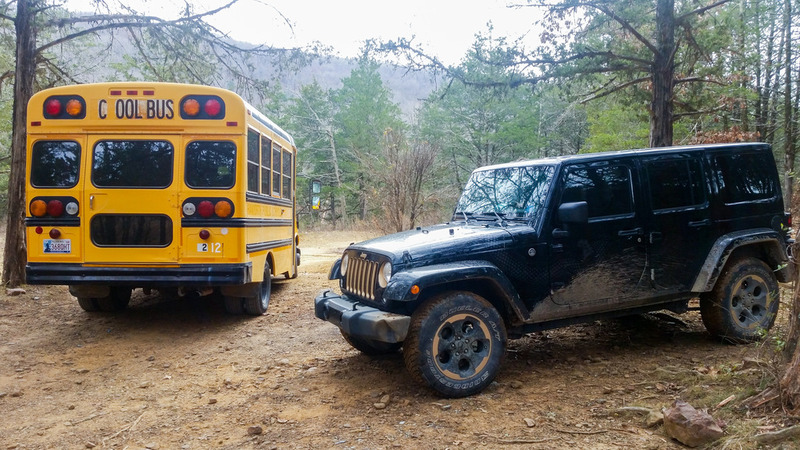 A friend met us Saturday morning for some offroading in his 4x4. It was a great escape for the weekend and I really started to see the appeal of being able to camp without unloading/loading everything. I have also had a chance to start working on a design for the build. Let me know what you think! The finished design will have a table in between the two chairs. Holler on the next shakedown... I live only an hour south of devil's den, and I coulda ran on up to Fayetteville when I dropped by to say hi! Same here man. I live in Fayetteville. Let me know anytime you guys are going to be around. We'll burn one.